"In heaven, all the policemen are British, all of the lovers are Italian, all of the chefs are French, all of the cars are German, and the whole thing is run by the Swiss. In hell, all of the policemen are German, all of the lovers are Swiss, all of the chefs are British, all of the cars are French, and the whole thing is run by the Italians." 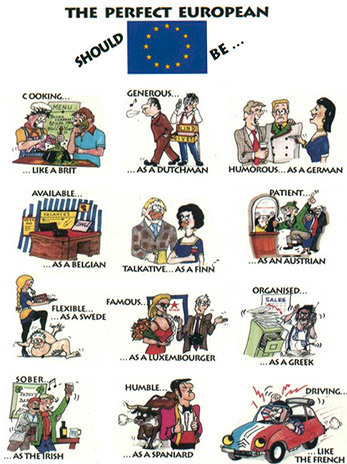 Stereotypes regarding people of specific nationalities. Some of them are a little bit Truth in Television (certain others more so), due to having some basis in reality. But remember, stereotypes are either half-true or dishonest exaggerations; nations are not Planets of Hats where everyone always look and act the same, and there are always differences and exceptions within groups. If anything, the true face of the country in question is often either not as expected or entirely different. This page serves as an index of tropes pertaining to any kind of ethnic/national/racial stereotyping. Please see Analysis.National Stereotypes to read more detailed, in-depth information about overall stereotypes.